The Collared Imperial-pigeon (Ducula mullerii) occurs naturally in northern and southern New Guinea and the Aru Islands. It has also been recorded from Boigu and Saibai Islands, Australian territory in northern Torres Strait. 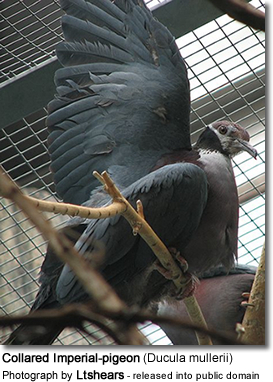 This large pigeon measures (40 cm in length and weighs about 600 g.
The upper plumage is grey. 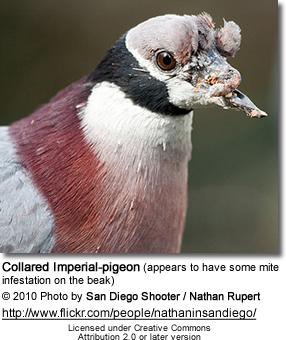 It is mostly grey pink below, except for the striking black collar and the white throat. They inhabit lowland rainforest, swamp forest and mangroves. They feed on fruits taken from forest trees and insects. The female usually only lays one single egg placed on a flimsy platform nest situated in a tree near wetland.